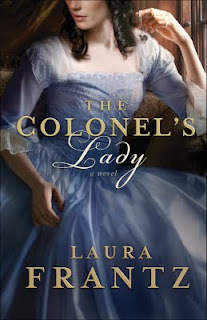 In 1779, when genteel Virginia spinster Roxanna Rowan arrives at the Kentucky fort commanded by Colonel Cassius McLinn, she finds that her officer father has died. Penniless and destitute, Roxanna is forced to take her father's place as scrivener. Before long, it's clear that the colonel himself is attracted to her. But she soon realizes the colonel has grave secrets of his own--some of which have to do with her father's sudden death. Can she ever truly love him? Readers will be enchanted by this powerful story of love, faith, and forgiveness from reader favorite Laura Frantz. Her solid research and deft writing immerse readers in the world of the early frontier while her realistic characters become intimate friends. I was a little hesitant to review this book at first, because I am not a fan of historical books, whether they're fiction or not. However, I was pleasantly surprised by this book! I felt that the first 70 pages or so were a little slow, and I was left wondering when the romance would begin to blossom. Once Roxanna meets Cass, the book became much more interesting and their romance took flight. Their romance fluttered back and forth throughout most of the book, as Cass is everything Roxie promised her mother she would never marry. However her attraction is unavoidable and deepens though each new thing she learns about him. Secrets abound however, between Roxie and Cass, and throughout the rest of Fort Endeavor. The must race to figure out what is truly going on within the walls, or it just might be too late to win the war! I loved this book and am looking forward to reading more books by Laura in the future!